Habitat improvements include coppicing large trees which have become unstable and are about to fall over, this process results in smaller bushier trees which have large roots. And sometimes the trees we coppice are used for bank protection. Pinning tree branches to the edge of the river provides fish with a place to shelter from predatory birds (and fishermen!!) 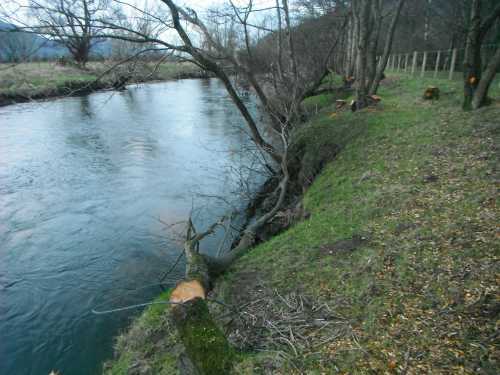 and it also slows the flow of water, trapping sediment and helping prevent further erosion of that stretch. See this great film by the Woodland Trust on how to plant trees.